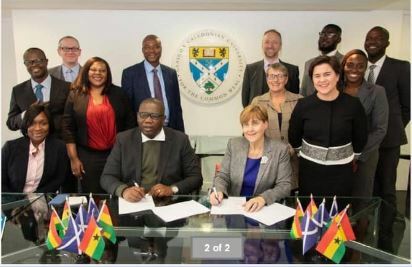 The Petroluem Commission has secured a partnership with Glasgow Caledonian University (GCU) to deliver work-based education to the oil and gas industry in Ghana. The agreement, which was signed on Monday October 2, 2018 with GCU, will provide educational support and help in strategically positioning Ghana’s oil and gas industry. The Commission and the GCU will therefore co-operate across the programme framework to identify where GCU may work to provide models, solutions, programmes, knowledge and experience. Under the Accelerated Oil and Gas Capacity Programme (AOGC) which was launched by President Akufo-Addo in November 2017, about 1,000 Ghanaians will be trained each year in technical skills and support will be provided to 200 SMEs and 300 employees in public institutions. The programme will focus on building capacity in tour areas: Technical, Vocational, Apprenticeship Development and Utilisation; Small & Medium Enterprises; Educational and Institutional and Public Institutions. Partners for the AOGC Programme include the Ministry of Energy, Petroluem Commission, the Ghana National Petroluem Corporation and Aker Energy. It is highly expected that other organisations would come in due course. The AOGC programme is aimed at empowering Ghanaians and Ghanaian companies with the requisite skills for them to actively participate in Ghana’s oil and gas industry. Government is determined to expand opportunities in the oil and gas industry, and use it as a catalyst for the rapid transformation of the country. All stakeholders, especially the managers of the AOGC Programme, Petroleum Commission, have been urged to ensure that all activities under the Programme meet the high standards, as set out by national and international accreditation institutions. Already, state of the art oil and gas facilities and a welding, fabrication and mechanical workshop constructed by the Oil and Gas Capacity Building Project (OGCBP), have been commissioned for the Regional Maritime University (RMU). ← Cocobod et al to go paperless by Nov.